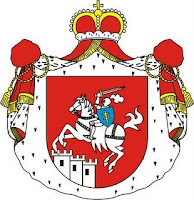 The princely family Czartoryski descends from Gediminas Grandduke of Lithuania (ca. 1275-1341), just as the families Galitzine, Khovansky, Kurakine, Sapieha, Trubetzkoy and Woroniecki. The origin of Gediminas is unclear. He was succeeded by his son Olgierd/Algirdas (1296-1377), whose son Constantin became the ancestor of the Czartoryski family. DNA-research in 2008 showed that although Galitzine and Trubetzkoy princes did have a common finno-ugrian ancestor, Czartoryski did not. Their DNA is of germanic origin. The one responsible for this is probably Isabella Flemming (1746-1835), wife of Adam Kazimierz Prince Czartoryski, who had several lovers, including Armand Louis de Gontaut-Biron, Duc de Lauzun et de Biron, of an old French (Frankish?) family. 75. Ludwika Mikulska * ... + ...; Dr van Izydor M.
122. Ignacy Stępkowski * ... + ...; Zn van Jakub S. en Franciszka Świetosławska = 78. 123. Cecylia Giżycka * ... + ...; Dr van Franciszek Ksawery G. en Weronika Sulatycka = 79.